Any advice is appreciated. I’m starting to think this is a SourceForge issue again, because I have been finding a handful of SSL issues. Judging by my experience in the last few months and all the support requests (“We’ve been making some changes, try again \*request closed\*”), SourceForge has turned into a steaming bucket of excrement. Someone please flush. 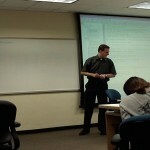 I do have some new pictures from today’s lecture about parsing and the extended visitor pattern, though. Explaining the extended visitor pattern with all the type parameters is more difficult than I thought. I’ve decided to spend another day on it. It turned out that an upgrade to the latest OpenSSL and Subversion software on our side took care of the problem. I figured that would be a more sensible first attempt, rather than downgrading to an ancient version of OpenSSL, which is what SourceForge recommended. This entry was posted in COMP202, DrJava, Pictures, Ramblings. Bookmark the permalink.